Rex Lee Jim, left, joins hands with Vice President Ben Shelly at a press conference held at the Ashley residence in Window Rock on Monday. 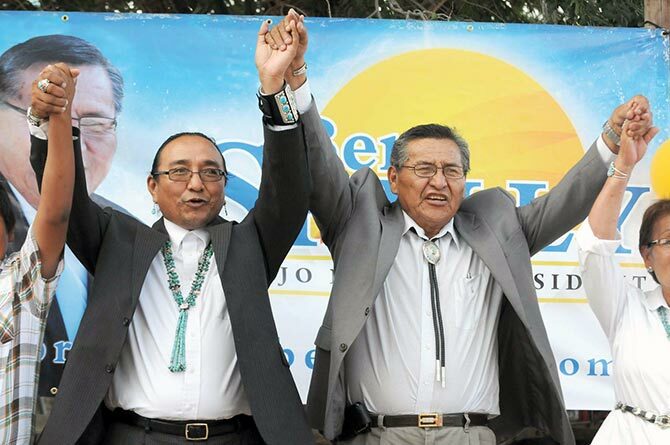 In choosing Council Delegate Rex Lee Jim (Rock Point) as his running mate, presidential hopeful Ben Shelly said his team was prepared to make history - the first vice president of the tribe to be elected president. Between Tuesday, when he placed second in the primary, to Sunday, when he made his decision, Shelly said he looked at 60 possible candidates. "Some of them were in the tribal government, some were not," he said. He decided, however, only to interview two people and of those two, he and his campaign staff were all struck by the similarity of his ideals and values with Jim's even though their backgrounds could not be more different. Jim, who is completing his second term in the council, has both an Ivy League education and an understanding of tradition and culture, something that Shelly said would be put to good use in a Shelly-Jim administration. This sense of tradition was evident when Shelly announced his choice of running mate Monday. He delivered his announcement outside a supporter's home in Window Rock. But beforehand, he spent a few minutes in the family's ceremonial hogan with Jim and a traditional prayer was held while a group of about 25 supporters waited outside. Jim wasn't the obvious choice, although he came in fourth in the primary with 4,224 votes. There were some reports that Shelly might ask Sharon Clahchischilliage, who came in fifth in the primary with 3,139 and could attract female voters. But in the end it was Jim's strong stance on educational and business issues and his desire to be part of the team that convinced Shelly. Jim, who could easily pass for a professor on the elite eastern campuses he once roamed, is Kin Lichíi'nii (Red House Clan), born for Táchii'nii (Red Stream Running Clan). Raised in Rock Point, Jim credits two Anglos who lived in the area, Sam and Janet Bingham, for encouraging his love of books. They helped him find his way to an alternative school in Asheville, N.C., which whetted his appetite for literature. He went on to earn a bachelor's degree in English from Princeton University and then a master's degree in English from Middlebury College in Vermont. After college, Jim returned home and taught for 16 years at Rock Point school and at Diné College. While he enjoyed teaching and felt challenged working with Navajo students, Jim said he decided in 2002 to see what he could do in tribal politics. He ran successfully for the council and was re-elected in 2006. Steeped in both the Western and Navajo cultures, Jim says that he finds the two to be quite comparable. For example, he was taught in Western society to have goals and take steps on a daily basis to meet these goals. That's no different, he said, than Navajo parents urging their children to start the day with traditional prayer. "Of course, I am excited about this opportunity (to run with Shelly)," he said following Monday's announcement. One of the things Jim said he enjoyed about the primary was talking to Navajos from all parts of the reservation and visiting areas he had never seen before. Education is one area Shelly would delegate to his vice president, and Jim has strong ideas about how to improve education. The changes, he said, will have to start with the parents because how a student approaches education begins at home. Reading is fundamental to learning in today's world, and Jim said he would like to see Navajo children all over the reservation have homes filled with books. He's a strong believer in Navajos teaching Navajos, and would work to ensure there are Navajo teachers at all levels of the education system. He would also encourage Navajo grandparents, aunts and uncles to visit classrooms and impart their knowledge. Shelly and Jim have been acquainted for several years, Shelly said, noting that they have worked together on various issues over the past eight years. Shelly said he would rely on Jim to help restructure the education system on the reservation, rebuild the Division of Education, and make the necessary changes so more schools on the reservation make adequate yearly progress. Discussing his plans for the coming general election, Shelly said he and Jim will travel together for the first few weeks but then will separate in order to visit as many chapters as possible. "I've received a lot of requests from chapters to meet with then," Shelly said, adding that he would prefer to spend his time at chapter meetings rather than pressing the flesh at public events, because it would give him more opportunity to discuss the issues. Both said they have no problem with the rigors of campaigning, when a candidate's days and nights are filled with speeches and discussions, often lasting until 2 a.m. or 3 a.m.
And Shelly said he's not at all discouraged by the fact that he came in a weak second to Lovejoy in the primary. "She only received 35 percent of the vote in the primary," he said. "That means 65 percent voted for someone other than Lovejoy." He also pointed out that a sizable number of people didn't vote in the primary. Thousands more are expected to turn out for the general election and these votes will be up for grabs, he said. As for Navajos living off the reservation, Shelly said he plans to make several trips to speak to urban Navajos and will emphasize that he and Jim have experience running the tribal government while the Lovejoy-Tulley camp is lacking in that area.